In accordance with the Copyright Act, Section 1, the copyright to the material and the thesis created by a student belongs to the creator, that is, the student. The copyright for example, includes the right to control the reproduction of the work and making it available to the public. Thus, the student may decide, for example, on the publication of the thesis and whether the full text of the thesis will be published online or will be available in the library. Copyright includes the author's financial and moral rights. Economic rights include the right to control the reproduction of the work and making it available to the public. The author's moral rights include rights of attribution and rights of integrity. In accordance with the rights of attribution, the author has to be notified in the manner required by proper usage. The author has the right to decide on the form in which his / her name is to be expressed and deviation from this is not generally considered appropriate. In accordance with the rights of integrity, the work must not alter the author’s literary or artistic reputation or individuality in an offensive manner or be made available to the public in a form or context that is offensive to the author. Important criteria for assessing this provision include the characteristics of the work, the artistic value and significance of the work and the original presentation. What are the related rights and how should they be taken into account in a thesis? Related rights are defined in Section 5 of the Copyright Act and can be described as being closely related to copyright. For example, photographs will be protected, at least by related rights. Photographs are always protected by a photographer’s related rights under Section 49a of the Copyright Act. Photographs that reflect the originality of their creator will have copyright as being a work of art. In a decision handed down by the Court of Justice of the European Union, a school photographer’s photograph of a pupil was regarded as an expression of originality. The general conditions for the application of the limitation provisions are laid down in Section 11 of the Copyright Act. Utilisation of the limitation provisions requires that the work to be quoted is made public, that the source and the author are mentioned in the way that proper usage requires, and that the exploiter has legally gained possession of a work or other material. The work has been made public when it has been made public with the permission of the creator, for example at an exhibition or on an open web page. The requirement of a legal source for example, means that a web page from which the image is downloaded is such that the image is there with the permission of the rights holders. If the image was originally unlawfully loaded on a web page, copying images is not permitted under the quotation right. For example, if a teacher has photographed an image, for reasons of clarity it is advisable to indicate his / her own name, for example; photograph: Tim Teacher. In addition, the architect, designer, artist or performing artist of the subject in the image should be mentioned. The second paragraph of Section 25 of the Copyright Act refers to the quotation of images. 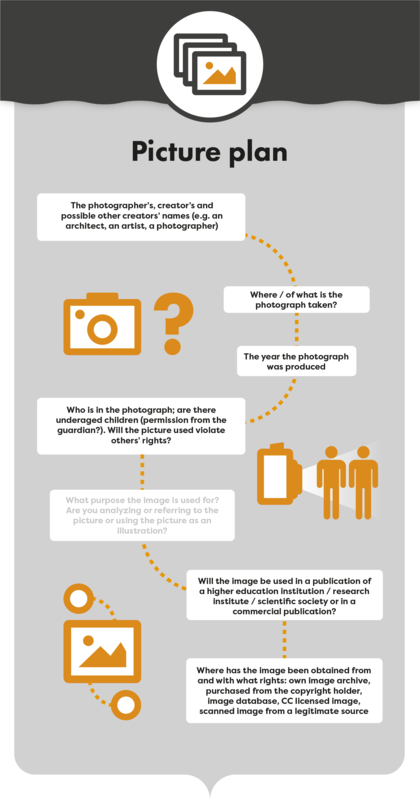 According to the provision, images may be reproduced without permission and without compensation for a critical or a scientific presentation, provided that the images have a material connection to the text. If the conditions of application of the provision are not fulfilled, quotation may still be possible under Section 22 of the Copyright Act. In addition to the conditions set forth in Section 25 of the Copyright Act, the use of the right requires the fulfillment of the general conditions of Section 11 of the Copyright Act; the borrowed work must have been made public, the name and source must be mentioned, and the source must be legitimate. The work has been made public when it has been made public with the permission of the author, for example, presented at an exhibition or an open web page. The requirement of a legal source for example, means that a webpage from which you download the image is such that the image is there with the permission of the rights holders. If the image was initially downloaded unlawfully to the webpage, copying the images under the right to use the quotation is not permitted. The image may be a photograph, a drawing, a photograph of an artwork, a picture of musical notation, a diagram or other explanatory drawing or other type of image. Section 22 of the Act primarily applies to the use of parts of a work, while Section 25 permits the use of the image in its entirety for non-commercial purposes. According to Government Decree HE 287/1994, pages 28-29, the criteria for a scientific presentation have become relatively broad in the practice of the law. For the purposes of this provision, there has been no requirement that a presentation has been made or published by a university or other research institute. Presentations for non-scientific communities have also been regarded as scientific by the law. It has been considered that a presentation is scientific if the way of presenting the subject has been scientific. According to the Copyright Council case 1992: 4, for example, the publication of Valtatieverkoston 2010 kehittämissuunitelma, a publication by the Public Roads Administration, Impact Assessment 5 was a scientific presentation. The scientific value of the presentation can also be based on the systematisation, choices and manner of presentation. A thesis is also evaluated using the corresponding criteria. 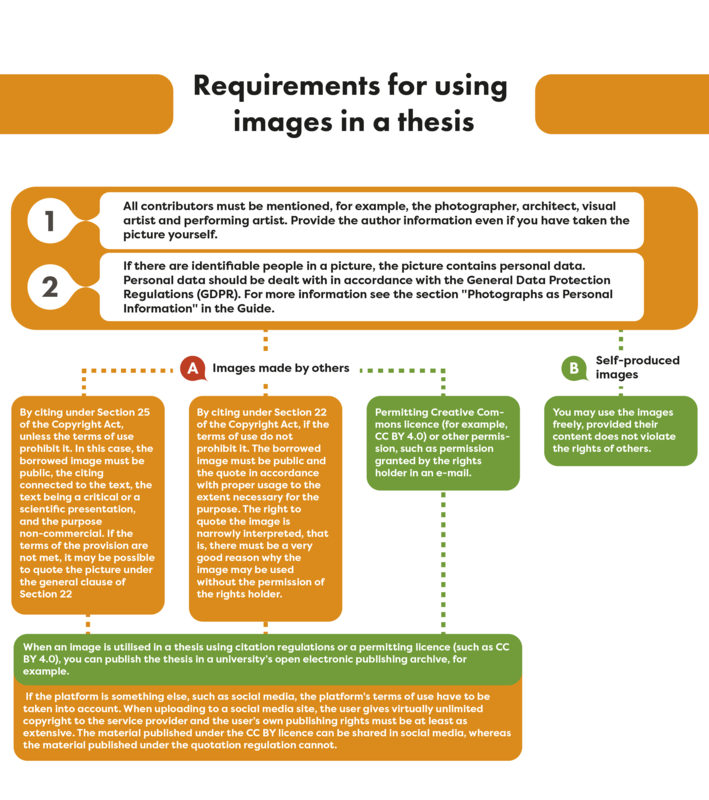 In the thesis, the image should illuminate the text of the thesis and the sources should be used in accordance with good scientific practice. The sources should be cited according to good citation practice. If the digital thesis is to be scientific, there must be sufficient verbal analysis of the material and the use of the sources in accordance with good scientific practice. In this guide you can find more information on how to cite images and the creators in accordance with proper usage. In this case, the ability to illustrate the scientific presentation under the limitation provision is also suitable for digital learning material. The relevant relationship is evaluated on a case-by-case basis, but it is not permissible to create a work consisting entirely of citations even if it would be pedagogically useful and justified. Section 25 of the Copyright Act also requires non-commercial purposes for citation. For example, lectures at the university or open university or a higher education institution acting as a publisher, have a non-commercial purpose. However, education exports tend to have a commercial purpose. According to Section 22 of the Copyright Act, in accordance with proper usage, citing to the extent required by the purpose is permitted. If the conditions under Section 25 of the Copyright Act are not fulfilled, the citation of the image may still be possible under Section 22. In addition to the above-mentioned general conditions (the contract does not prohibit citation, the cited work has to be public, the name and source must be mentioned, and the source must be legal), the conditions of Section 22 have to be fulfilled. In this case, the borrower does not have to ask the rights holder for permission to use his / her work as part of the borrower's own work or to pay the rights holder compensation for the use of this work or part thereof. This provision gives you the right to use copyright material in another context as part of a new work. The citation right applies to all types of works, that is to say, under Section 22, you can also cite pictures. In addition to the general conditions, the citation must meet the requirements of proper usage to the extent required by the purpose. The most important requirement for proper usage is that it requires a material connection between borrowable and borrowed works. The requirement of a material connection concerns the relationship between the borrowed and the borrowing work, that is, the purpose for which quotation is permitted. For example, borrowing a picture to adorn an update for social media could not be considered to be proper usage. 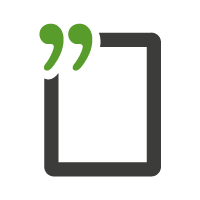 However, in a thesis in which someone else’s photograph has been cited to illustrate the text of the project that is distributed on the university’s open learning platform, the quotation would be in accordance with proper usage. It is therefore essential for a material connection that the work to be quoted to illustrate, clarify or provide background to the borrower's own presentation. Because of the absence of a referral function and material connection, it is not permissible to create a work composed of quotations only without the rights holder's permission (Harenko, Niirala and Tarkela, Tekijänoikeus, 2016, pp. 203-205). The term ‘to the extent that is required by the purpose’ is assessed on a case-by-case basis and for example, means the length or purpose of the citation. The permission to cite has been evaluated in the decision practice of the Copyright Council. In decision 2016:16 by the Copyright Council, six photographs and related captions were used in an article about a photographic exhibition and a photography book. In this case, images and caption texts were allowed to be cited under Sections 25 and 22 of the Copyright Act, as the images and texts contained a material connection to the text in the article. The permissibility of citing has also been evaluated in the Supreme Court's case concerning the musical work ‘Lapualaisoppera’. The solution has been discussed, for example, on the Turre Legal Parody website. If you want to utilise material created by a third-party more widely than the citation rights allow or if the license terms forbid for example, the use of images, you can ask for permission from the rights holder, for example by email or he / she can give permission in an agreement. Also, permission from the Kopiosto Copyright Society allows you to provide limited access to the material among the course participants, for example in a closed Moodle session. It is recommended that you make use of Creative Commons licensed material as much as possible in your own material, as CC-BY licensed material can be widely distributed, for example, on open web platforms. According to copyright law, work has been made public when it has been legally made available to the public. Application of the citation clauses (Sections 22 and 25) also requires that the work has been made public. By making a work public it is made available to the public, but it does not necessarily require that the work has also been published. An author can read out a short story he / she has written in a park or at a literature evening; an artist can display his / her painting at an art exhibition; a computer programmer can present code he / she has written on his / her computer at an Internet café; or a singer can present a musical work at a concert. In these cases, the work has been made public. If the work is never sold or otherwise disseminated, for example, in the form of a printed book or as prints of graphic art, the work has not been published in the way the Act requires (Harenko, Niirala and Tarkela: Tekijänoikeus 2016, p. 90). The publicity of higher education institutions is governed by the Act on the Openness of Government Activities (621/1999). The final approved projects are the authorities’ public documents (OPM 3/500/2004). Most universities require that a thesis to be submitted for approval must contain no confidential information. In principle, the underlying research material behind the admissible project is confidential. The publicity of a document means that everyone has the right to obtain information in public authority documents. The authorities need to promote the transparency of their activities and inform the public about their activities. The authorities need to ensure that documents or lists of documents relevant to the public’s access to information are available in libraries or public information networks or other means accessible available to the public. Theses have an important role in the operations of higher education institutions. Higher education institutions disseminate theses in several ways, taking into account the authors' privacy and copyright. Access to information can be arranged in different ways, for example, a thesis may be available transparently online with the consent of the student or on a bookshelf in the library. Information on the content of a thesis that is not directly accessible to the public should be provided on request. The higher education institution may keep basic information about the approved theses online in an appropriate context, for example in the library's database. Such basic information for example includes the author’s name or name of the work, study programme, supervisor and date of approval. At some universities, a summary of the thesis may also be included among these basic data. If a student wants to ensure the optimum further use of his / her work, he / she may wish to license the work by using a Creative Commons licence.